To start, we wouldn’t say we’re superstitious. But we definitely are a little stitious. Especially around the playoffs, when the stakes are higher than ever and there’s absolutely no margin for error, you can’t have the potential of even the strangest bad luck charm hurting your team’s chances. So, when dead animals start falling from the sky right before the the second game of a playoff series - it can definitely be a little alarming. 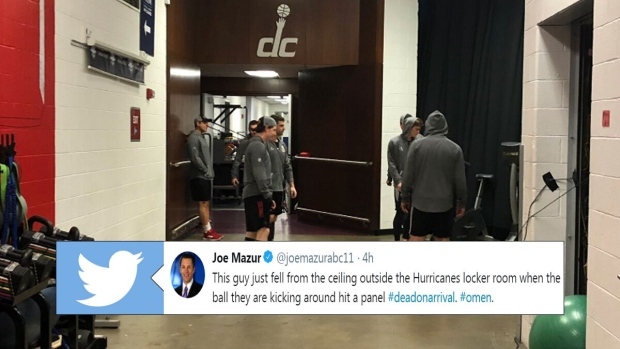 Such was the case for the Carolina Hurricanes, who, while warming up before their tilt against the Caps, had a dead mouse fall from the ceiling when the ball they were warming up with went astray. This was definitely a little eerie, and hockey fans were quick to provide some hilarious responses to Ceiling Rat. Dang, the refs just hanging out in the drop ceilings huh??? Is this very bad luck, or very good luck? Marchand might be out for Game 2 in Boston.